He’s authentic. A one-of-a-kind man with a rich and diverse history in Sarasota who loves what he does. And what he does is tell people what something is worth, from treasured family heirlooms to paintings picked up at an estate sale. If Andrew Ford were a painting, he would be priceless. 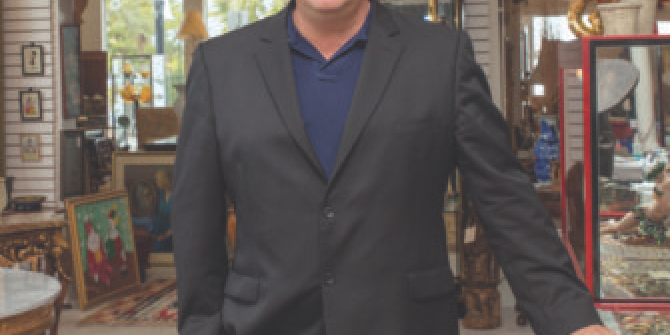 He has a passion for appraising, selling, trading and auctioning fine art and antiques. He does so with a genuine smile, a firm handshake, and an easygoing demeanor that creates long, trusting relationships. 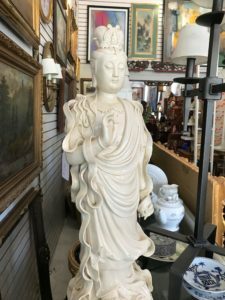 He does it the old-fashioned way – over time – one at a time – with each and every customer that enters the door at Sarasota Trading Company in Historic Burns Square, Sarasota Estate Auction and Ford Art and Antiques. Andrew proudly wears the heritage of his Ford family name as a father, husband and businessman every day of his life. Originally from New England, Ford, a certified appraiser and collector, has carved out a wonderful life in our town. He’s gotten to know many people and what is valuable to them. A seascape painting of the Gulf. A Chinese plaque. A sterling silver set handed down from your grandmother. But no matter what treasures come in and out of his door, what he treasures the most are his clients. As I prepared for my interview, I wondered what my Jimmy Cagney autograph was worth. Well, wonder no more. I knew that Andrew Ford could give me the right answer. So I smiled. Okay, so it wasn’t a Mona Lisa smile, but it was smile nevertheless as we sat down and looked at some scenes from an interview of his life. WHERE WERE YOU WERE BORN? New Bedford, Massachusetts, which is the whaling capital of the world. At one point, it had the highest per capita income of the world. PAINT A PICTURE OF YOUR CHILDHOOD GROWING UP. I lived on the water. I grew up on a compound where we had our antique shop and a few houses, so I was always in the business. I was the eldest boy in the family. As soon as I could lift anything, my dad had me on the payroll from day one. My first job when I got my license was to deliver some merchandise to New York City. HOW DID YOU FIND YOUR WAY TO SARASOTA? In the 1970s , my dad bought multiple houses in the village on Siesta Key. It was a different time then on Siesta Key, a little quieter. In the late 70s, we sold some of these homes and moved near Point of Rocks. IT SEEMS TO ME THAT EVEN TODAY YOU STILL ENJOY LEARNING. Ever since I was four or five years old, I always had collections of objects. My father started me with a jack knife collection. I was into pocket knives growing up. Buying and selling. Every time I would go to a shop, I’d find a pocket knife and the owner would feel sorry for me because I was so young, and I’d get a good deal on a knife. During my freshman year of college, I sold that pocket knife collection for a strong sum of money. I went to a couple of private schools in Florida. For college, I attended Northeastern, a business school in Boston where I studied International Business. I was fairly fluent in Spanish. We all have dreams of sports, theater and movies and things like that. But it was always drilled into me from day one to be a merchant one way or another. Buying and selling early on was a lot of fun and always gave me a lot of joy. AND THAT’S WHAT YOU’RE DOING TODAY. Yes, I’m living the dream. Even when I was younger in college and we had a sports team, I referred to myself as Andrew Ford and Company because I knew someday I’d be working for myself. YOU’RE ALWAYS LEARNING. DO YOU CONSIDER YOURSELF AN EXPERT IN YOUR PROFESSION? I try not to use that word. You’re really setting a bar to a level for failure when you claim that you know it all and that there is nothing else to learn. In this business, I’m learning every day. I KNOW THAT YOU HOST YOUR OWN FACEBOOK LIVE SHOW, “WHAT IT’S WORTH,” BUT DO YOU ALSO WATCH OTHER SHOWS LIKE ANTIQUES ROADSHOW ON PBS? I do watch. I know many of the individuals that you see on the Antiques Roadshow. I’ve sold them many objects and they’ve come to Sarasota to see me and some pieces. Many of them are considered the masters in the antiques world. It really gets the word out and it shows how we appraise. Most of them are verbal appraisals and they are objects that are coming out of local estates. IN OPERATING YOUR THREE BUSINESSES YOU WEAR MANY HATS. HOW DO YOU TIE THE BUSINESSES TOGETHER? I suppose that from a buying perspective when I go to an estate, I’m always looking for objects that are going to perform better in different venues. Fine art and antiques are great for our auctions, but they are also great for our high-end trade shows. Antiques are really important regionally. What works in fashion in Florida doesn’t always work in the Northeast, and vice versa. YOUR KNOWLEDGE ABOUT ALL THINGS ART AND ANTIQUES IS UNCANNY. HOW DO YOU STAY IN THE KNOW ABOUT SO MUCH INFORMATION? I do a tremendous amount of reading of trade journals, reference guides and newspapers that are involved with the arts that inform me of trends. I love reading about artists, especially older artists. Through the past 25 years, I’ve handled tens of thousands of paintings and objects through the auction. I do the research when I buy a painting with my own money. I like to learn as much as I can about the artist and their background. IS THERE A PARTICULAR GENRE OF ART OR ANTIQUES THAT IS YOUR STRONG SUIT? Originally it was American furniture. In the 1990s when I first started, and even through the early 2000s, American furniture really was the apex of collecting. Then there started to be a decline in certain pieces, so I started to favor art in general. You’ll notice that the art has truly increased in the last 20 years, and brown, or American furniture, has decreased over the same period. WHAT IS THE BIGGEST DETERMINING FACTOR IN ASCERTAINING WHAT SOMETHING IS WORTH? It probably requires a handful of factors that really determine value. When I talk about art, I think about scarcity. You hear about an artist after they pass away. For anyone with an infinite number of paintings, it’s hard to gauge the value. Once it’s a finite number and the artist has passed away, and there are only so many paintings or works left, that’s when you start seeing an uptick in value. IT’S REMARKABLE TO THINK THAT A MASTER PAINTER LIKE VAN GOGH NEVER SOLD A PAINTING WHEN HE WAS ALIVE. You find that a lot with artists. They tend to be peculiar when it comes to social experiences, so a lot of these artists don’t quite know how to market themselves properly. I collect paintings, furniture and silver. I’ve always been an aficionado of American silver in particular. DO YOU GROW ATTACHED TO THINGS AND ARE THERE SOME ITEMS YOU WOULD NEVER SELL? There are certain things I own that I would never sell. The Titanic baggage claim ticket is one of them. But for the most part, I don’t get terribly attached. I’ve learned that there is more around the corner in this business, and it’s best not to hold on to everything. Evokes a certain amount of emotion and movement. In every painting, you’re looking for the action in the painting itself. The execution, whether it be a sculpture, a painting or even a cabinet. I’m looking for lines. What you love, first and foremost. But I would add areas where there is wide collector spectrum. If you get into too narrow a field, you’re really eliminating who might be a buyer on the secondhand market. Has scarcity to some degree. You want to buy something that’s not readily available, and something that holds its value over longevity. Understanding that the materials you’re playing with and the markets and trends, and whether or not a market is going in an upward or declining direction. To be able to understand your customer by asking them questions and being able to listen is paramount. I’ve found that listening is half the battle. You have to able to listen to what your customer is asking for. HOW HAVE YOU SEEN THE MARKETS CHANGE OVER THE YEARS? Where before antique dealers were influencing the buying and selling, now through social media, the designers and magazines like Southern Style and Antiques Magazineare really the influencers now. You’re starting to see on magazine covers people using an 18th century chest with a contemporary painting to create an environment that’s pleasing to the eye and that seems relevant today. WHAT’S THE BIGGEST JOY YOUR PROFESSION BRINGS YOU? I really enjoy the social aspect of the business. Talking with people. The stories they tell me. How they came to Sarasota and how they came into the objects that they have. How some have been passed down by family members. I’m fascinated by that. WHAT ADVICE CAN YOU GIVE TO THOSE SELLING THEIR ITEMS OR HEIRLOOMS? It might sound strange, but I tell people to sell the object when you have money. Don’t wait until you’re in a position where you are going to get squeezed. The best leverage is when you don’t really need the money. I’D IMAGINE IT’S MOST DIFFICULT TO TELL PEOPLE THE UNVARNISHED TRUTH ABOUT A PARTICULAR ITEM, THAT THE OLD TREASURED SCULPTURE IS NOT WORTH 5 OR 6 FIGURES BUT IN FACT IT IS QUITE COMMON. That is difficult. What’s hard is seeing the face on someone when you feel they’re really in need of the money. I sometimes overpay on an object when their needs are immediate. I don’t mind doing it. It gets your karma up. HOW MUCH FUN DO YOU HAVE AUCTIONEERING? I have a great time; I enjoy it tremendously. It’s been a long journey. I remember back in the day doing my first auction and doing less than fabulous numbers and being so psyched and excited at how well I did. A lot of things passed. We weren’t well known. Now if we don’t do anticipated and much higher numbers than those over our two-day auction, I want to cry. WHY DO SOME ITEMS PASS AT AUCTION? A combination of things. Was it improperly marketed? People look up objects based on keywords that you include in describing the object. So if you don’t have a good description, people won’t be able to look it up. Vague terms don’t work. You have to be object-specific. That’s how they find you. Some people are looking for French porcelain or English furniture or American Impressionism. You’ve got to know your objects. To me, research is the most fascinating part of the whole business. I’m thrilled when I have a great object but don’t quite have enough information on its background. I get on the Internet and start connecting the dots as to the object’s background. I haven’t sold the item yet, but I’ve learned a whole lot about it, and to me that’s exciting. PART II OF YOUR ASIAN AUCTION IS TAKING PLACE ON AUGUST 11 AND 12. CAN YOU TELL US ABOUT PART I OF THAT ASIAN AUCTION? Years ago I did an appraisal talk in Lakewood Ranch and a woman brought in some Chinese export porcelain. Whatever I said to her at the time resonated and she kept my information. Five years later she came into my shop and told me that she wanted to give me the opportunity to sell some of her objects. Her great-grandfather was a missionary and serious collector in China, acquiring antiques and porcelains that had ties to the area. I always encourage my consigners to allow me to estimate items at a low level so it creates interest. Instead of putting that big 50 thousand dollar estimate on something, we estimated a plaque from this collection at around a thousand-dollar level. That created interest domestically as well as internationally. Everybody thought they were going to steal the item, so everybody wanted to put in a bid. Before the sale we knew we had a $41,000 bid on the object we originally estimated at a thousand dollars. We’re already at $41,000 and we had eight phone bidders. I ended up hammering the item at $190,000 plus the buyer’s premium. So it’s a quarter million-dollar plaque. Patriotic porcelains from this collection are coming up for sale in Part II of the Asian Auction. It’s thrilling. It’s a job well done. When you have the consignor in the audience watching and they nearly have tears in their eyes, you know you’ve done well for yourself and the consignor. You feel good because you have a fiduciary responsibility to get the most for your client. It’s a very satisfying feeling. TELL US ABOUT THE BAGGAGE CLAIM TICKET FROM THE TITANIC THAT YOU SAID YOU WILL NEVER SELL. Years ago our family acquired a baggage ticket that belonged to Eva Hart, a little girl who escaped with her mother on a lifeboat on that ill-fated night during the maiden voyage of the Titanic. It is a rare collectible and one that could bring in six figures at auction. That would be extremely difficult to part with. To me, that piece of antiquity from the Titanic means something different altogether, because our family lost four Ford family members when the Titanic sank in the frigid waters of the North Atlantic at 2:20 am on April 15, 1912. HAVING GROWN UP IN THE BUSINESS, WHAT ARE THE IMPORTANT THINGS THAT YOUR DAD TAUGHT YOU ABOUT THE ART AND ANTIQUE BUSINESS? My dad was an authority and well-respected as a buyer, seller and appraiser. He was one of the founding members of the New England Appraisers Registry, a high-society group of appraisers who did and still does appraisals for Harvard and Boston University. The most important thing my dad taught me was to be consistent, honest and upfront with your clients right off the bat. IS THERE A PIECE OF ART OR AN ANTIQUE YOU’LL LEAVE TO YOUR SON TO REMEMBER YOU BY? I was given a mirror, an American Federal period Queen Anne mirror, that belonged to one of the signers of the Declaration of Independence who is a distant relative of mine. That’s certainly an object that I would like to hand down to my son and hopefully to his son and keep it in the Ford family.